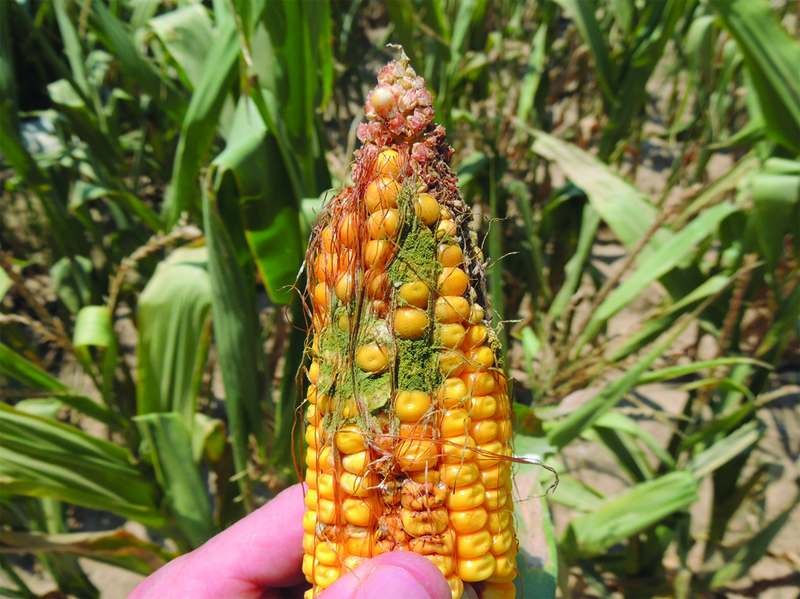 Aspergillus ear rot is one of the most important diseases of corn. It is caused primarily by the fungus Aspergillus flavus, but a few other Aspergillus species may be involved. Typically, this disease is more common in the southern United States than in other areas. 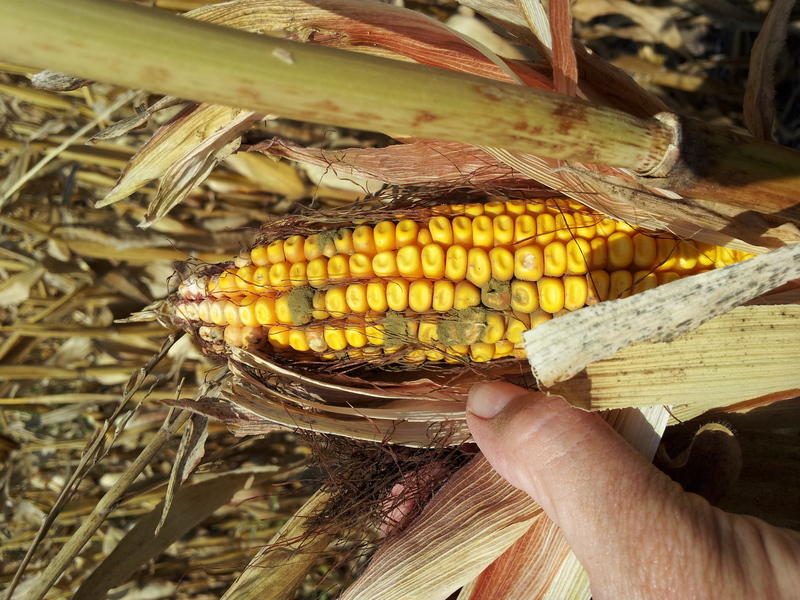 Aspergillus ear rot appears as an olive-green mold on the kernels that may begin at the tip of the ear or be associated with injury from insects, birds, or hail. The fungal spores appear powdery and may disperse like dust when you pull back the husk. These signs are most commonly observed at the tip of the ear, but can be scattered throughout the ear and all the way to the base of the ear. Aspergillus ear rot disease cycle. 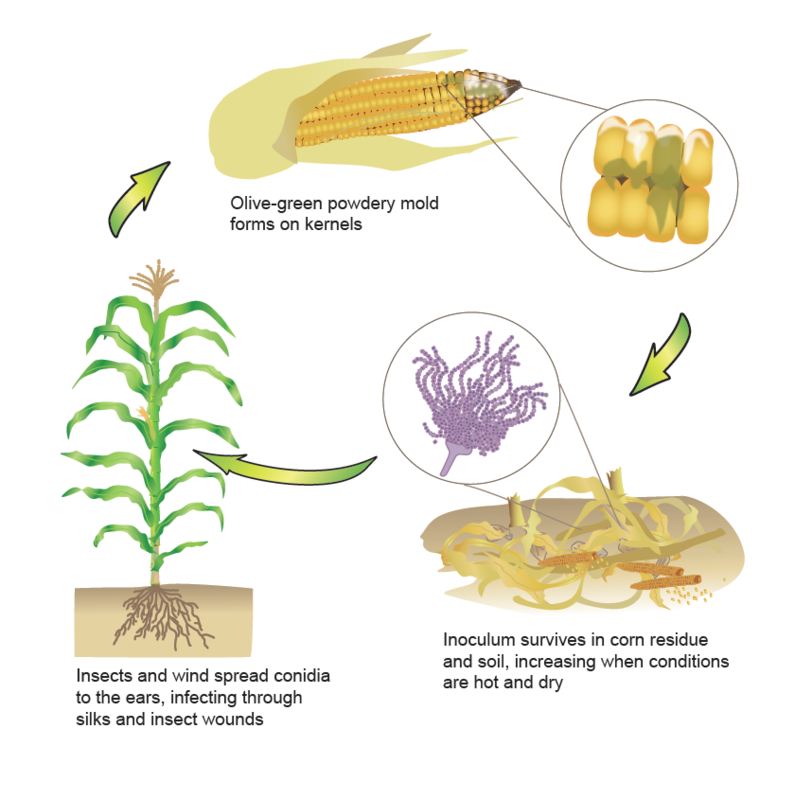 The Aspergillus fungus survives in soil or crop residue and infects ears during late silking. Spores are spread by wind and insects and infection takes place through insect wounds or other types of wounds or through the silks. 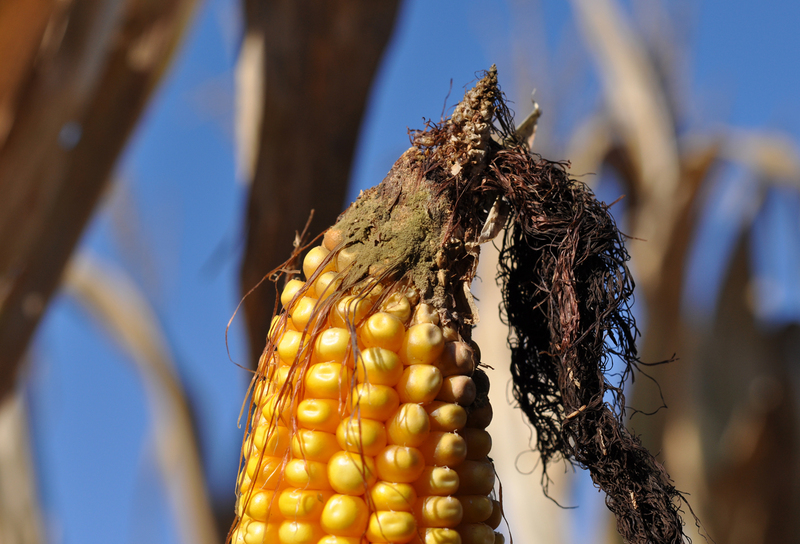 Hot, dry conditions favor infection. Stressed plants (from nutrient deficiencies, drought, or feeding damage from ear-invading insects) are often more susceptible to this disease. Gallery images: G. Munkvold, T. Faske, and A. Robertson. 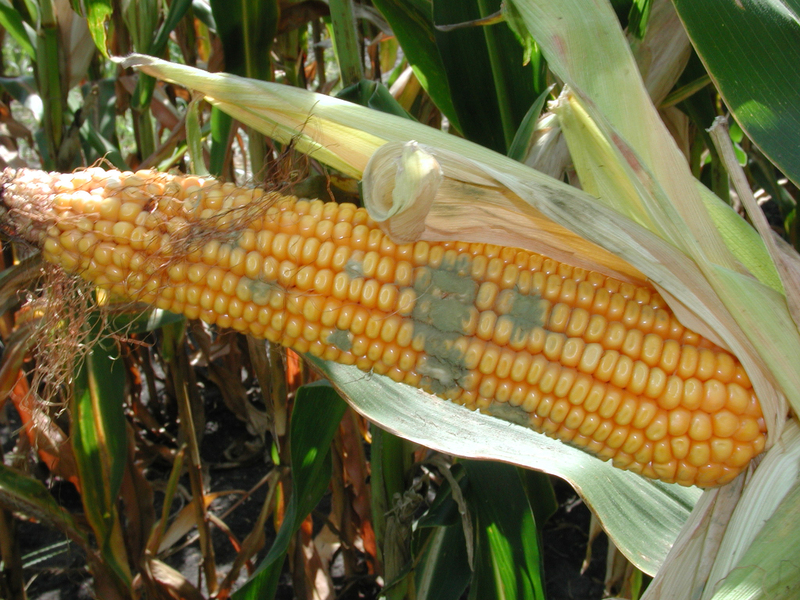 Aspergillus ear rot signs can sometimes be scattered across the ear. 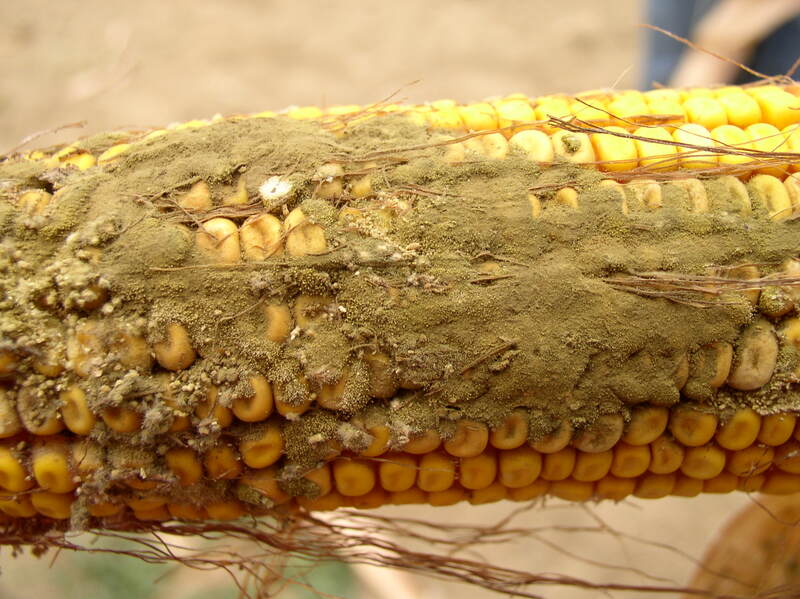 Aspergillus ear rot fungal spores appear powdery and grayish-green. Olive-green mold on ear characteristic of Aspergillus ear rot.